Amb. Vasin Teeravechyan (left) of Thailand with US. 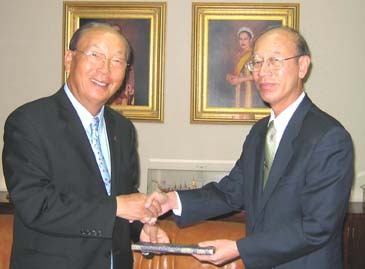 Chung (right), president of Korea Tourism Association, posing for The Seoul Times. With overall air traffic through Thailand's five major airports picking up steam, more Korean honeymooners are now coming back to major popular Thai destinations, notably Phuket which was badly hurt by the Dec 26 tsunami. "The number of Korean tourists to Phuket is returning to the pre-tsunami level recently," Sasi-apha Sukontarat, director of Tourism Authority of Thailand Seoul Office, told The Seoul Times. Air movement through Phuket should emerge from the doldrums beginning next month, as both local and international carriers step up their flight services to the resort island to cash in on the high season, she said. Following Korean Air and Thai International resuming direct air service to Phuket this month, Asiana Airlines will fly twice a week direct charter service to the resort city of Thailand starting on Oct. 26 while Austrian Airlines has publicly announced plans to restart two flights a week from Vienna to the southern Thailand destination in November. Mode Tour will put a 269-seat chartered plane into the service, which is available on Wednesday and Saturday. Korean honeymooners, FITs and incentives to Phuket and other popular destinations are visibly increasing in recent months and are expected to gain further momentum, she said. Ms.Sukontarat also said that Thailand in coordination with Malaysia and Singapore have organized a three nation familiarization tours for local media and travel agents this month as part of their efforts to invigorate backpacking tourism combining three countries. Based on feedback from the familiarization tour participants, the details of backpack tour products covering Malaysia, Singapore, and Thailand will be fine-tuned through further consultations between travel agents and NTOs involved, she said. Mode Tour will solely operate the charter plane through Dec.20 this year before turning it into a joint charter with other travel agents thereafter. With joining of Asiana in Phuket market, the number of passenger seats available on the route will increase up to 2,500 a week. Mode Tour plans to market honeymoon market products ranging from five days with three overnights in format to six days with four overnights. Mode Tour will step up is promos through news media, distribution of promotional materials and outdoor billboard. Korean Air earlier announced its plan to resume its direct air service to Phuket with a 260-seat plane starting Oct. 2. Thai International also announced its decision to inaugurate direct air service starting Oct. 2. At present, Hana Tour and Mode Tour are in control of more than 70 to 80 percent of passengers seats destined for Phuket. Sasi-Apha Sukontarat, director in the Seoul Office of Tourism Authority of Thailand. The latest figures from Airports of Thailand Plc (AoT) showed that flights through the five airports _ Bangkok, Chiang Mai, Hat Yai, Phuket and Chiang Rai _ increased by 12.64 percent to 303,850. The number of passengers rose 5.37 percent and cargo volume increased 7.7 percent to 1.06 million tones. Industry analysts say overall air traffic volume through the airports, operated by AoT, should start to pick up this month as the high season approaches and that the September figures may result in higher growth for the whole of fiscal 2005. The airport in Hat Yai showed the highest growth in all categories during the October 2004-August 2005 period. Its number of flights leaped 49.27 percent, while passenger totals grew 31.44 percent and cargo volume climbed 18.12 percent. In sharp contrast, flight frequency at Phuket's airport contracted 8.63 percent, with passenger numbers dwindling 22.65 percent and freight dropping 13.35 percent. Air traffic through Bangkok International Airport showed consistent growth with frequency rising 14.56 percent, the number of passengers up 7.21 percent and cargo up 8.26 percent. Low-cost carriers have contributed to traffic volume at most of the five major airports and especially helped Phuket's airport from showing even worse figures. An analyst noted that the traffic through Chiang Mai International Airport would have been higher if Thai Airways International had not cut back on flight frequencies to the northern city. In Phuket the occupancy in hotels was only about 10 percent in February after the tsunami. "Now, it has climbed to 60-65 percent," said Ms Nikki Kim, senior editor of Travie, a weekly travel trade journal, who has recently been to Phuket on the spot reportorial mission. A lot of reconstruction has taken place in Phuket and tourists, especially from Korea and the Middle East, are back, she said. Travelers have had hard time flying to the resort island as the national flag carriers of both countries suspended flights on the route following last December's killer tsunamis in the region. Since the flight suspensions, Orient Thai Airlines and Phuket Airlines, another Thai carrier, had flown the route, but Phuket Airlines decided to cease services. After a roller-coaster ride from robust growth last year to dismal results in the first half of 2005, Thailand's economic outlook is brightening. Tourism is reviving, agricultural output is recovering from a drought, and, to judge from buoyant automobile sales, there may even be some resilience in consumer spending. Economists now hope that more robust growth in the second half of the year will keep the economy moving steadily forward into 2006, when they say the benefits of the government's big push on infrastructure spending will start to kick in. Already, some businesses are seeing a pickup. Amb. Vasin Teeravechyan of Thailand. (left) with US. Chung, president of Korea Tourism Association come to understanding on Sept. 26. According to Merrill Lynch, Thailand, once among the best performers in Asia, looks likely to bump along close to the bottom of the performance charts, with 4 percent growth in 2005 and much the same in 2006, well below the 7 percent average for Asia excluding Japan this year. For four years, Prime Minister Thaksin Shinawatra presided over a robust, demand-led recovery from the mess left by the 1997 Asian financial crisis. He paid off an International Monetary Fund rescue package ahead of schedule, built up a hefty foreign exchange reserve cushion and still managed to find resources for a raft of measures supporting farmers and small businesses that were intended to energize the domestic economy and reduce dependence on exports. In the meantime, the killing of the two marines in the southern Thai border province of Narathiwat, on Sept.21, would not affect the tourism since most tourists had been aware of the southern unrest for long, according to Amb. Vasin Teeravechyan. 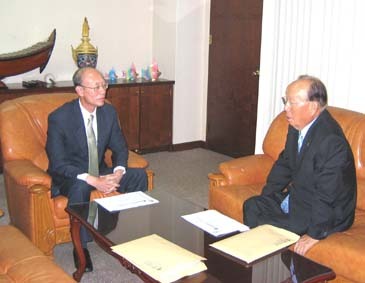 He made the points when US Chung, president of Korea Tourism Association paid a courtesy call at his office on Sept. 26. 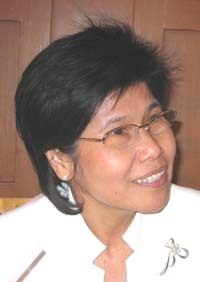 Chung is scheduled to attend 3rd Global Summit on Peace through Tourism at Royal Cliff Beach Resort, Pattaya, Thailand , October 2-5, 2005 as a special speaker. The theme of the Summit is "One Earth, One Family:Travel and Tourism-Seving a Higher Purpose." More than 300 travel trade businessmen and other prominet figures from all over the world will attend the international forum. Amb. Vasin Teeravechyan of Thailand. (second from right), US. 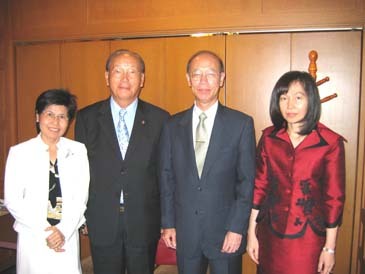 Chung, president of Korea Tourism Association (second from left) along with Sasi-Apha Sukontarat (first on left), director in the Seoul Office of Tourism Authority of Thailand and Vanvisa Thamrongnavasawat (far right), minister of Thai Embassy. Thai envoy downplayed the spate of violence involving Muslim extremists in the deep South of Thailand saying :"There is no serious religious confrontation between Buddhists and Muslims." He then pointed out that Thailand sees enormous scope to increase the number of tourists from the Middle East, notably GCC States. "Already there had been a remarkable growth in the number of tourists to Thailand from Islamic countries in the Middle East such as Saudi Arabia, UAE and Qatar, to name just a few," Amb. Vasin Teeravechyan maintained. With Qatar Airways having direct flights to Bangkok, a growing number of tourists from the region are coming to Thailand.. The MoU was signed by Oman's Commerce and Industry Minister Maqbool bin Ali Sultan with Thailand's Tourism and Sports Minister in the presence of Sayyid Fahad and Thai Premier Dr Thaksin Shinawatra at the end of a session of official talks between the two countries. The Omani deputy prime minister was visiting Thailand as part of a three-nation Asia tour. He and his team, including five cabinet ministers and leaders of the private sector, also visited Korea on the second leg of their trip.and headed for China on Sept. 23.